Quay Ingredient is a tiny little cafe situated right near the Quay (obviously..) not immediately clear from the menu is that they can pretty much alter any of the menu to make it gluten free as they have GF bread. They can’t toast the bread but they can warm it in the oven. I opted for the avo on toast with poached eggs and added a side of bacon. They have a good understanding of gluten free here, so would definitely recommend. Plus, the prices are really reasonable! 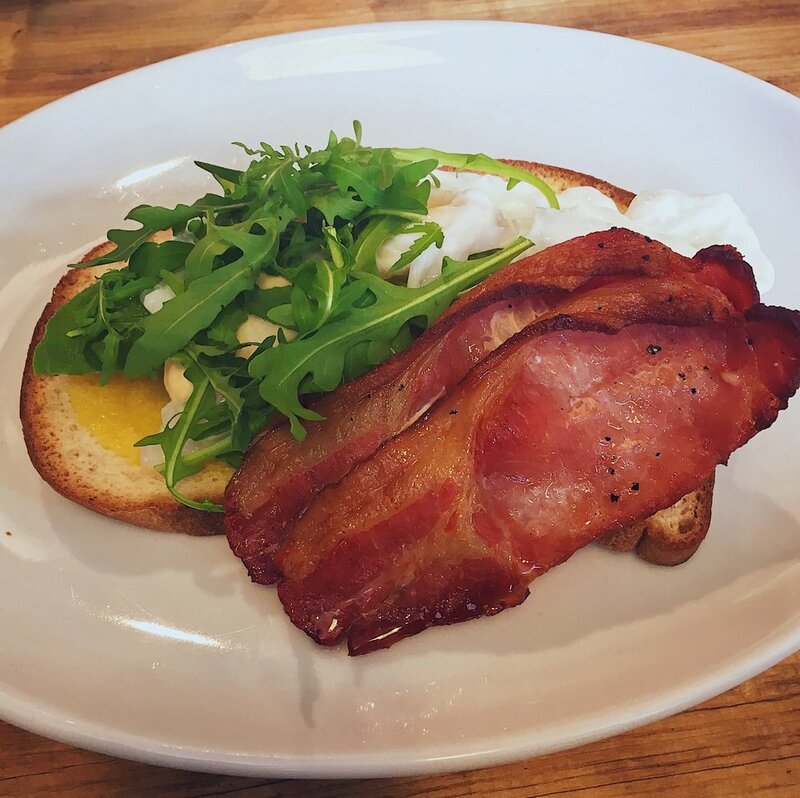 In the town centre Olive & Bean is also a good option for breakfast, they also offer gluten free bread and have a good understanding of allergies. I have also tasted the avocado on toast with bacon here, which was very tasty. Make sure to check about their bread toasting here as it may change! Lunch is always a bit of a tricky one, and being gluten free I’m sure you’ll agree. Naturally, Newcastle has all of the standard chain fayre, but I wanted to try something more local - unfortunately I ended up going back to a restaurant I had already eaten at (sigh..) but it was still good! Olive & Bean, have a selection of sandwiches, mezzes and salads all that can be made gluten free - which is amazing. They use Genius bread, which isn’t bad and have a really good selection of healthy and not so healthy fillings. I tried to halloumi and red pepper sandwich, which was tasty and quick. As above, make sure that they are toasting in a separate area. There’s quite a few gluten free options online, but I scouted and found what I thought would be the best place, I have 2 options, 1 fancy and 1 right in the town centre which was £7.50 cocktails! Lola Jeans is a cocktail bar/restaurant right in the centre of town. They take part in a yearly burger contest in Newcastle and have won the past couple of years! I saw the burgers as I was waiting for a table and knew I had to try one! If you are not interested in burgers, Lola Jeans offers a separate gluten and dairy free menu, which is full of tasty and healthy options. I had to ask quite a few questions about the burger toasting and cross contamination, the server ensured me they could make any of the burgers gluten free but there’s a fried chicken one so I doubted this. I choose the simplest burger, cheese and bacon in a gluten free bun, which a side of spicy rice (chips aren’t gluten free), as I thought this would be the safest option. When it arrived, the burger looked absolutely amazing, it was SO cheesey and cooked to perfection. The bun was the most like a brioche I had ever tasted. You should definitely get yourself here, the cocktails are great and reasonably priced. Just make sure you communicate your GF needs! The last time I was in Newcastle I stayed in this hotel, so decided to eat at the restaurant as I was being lazy. The restaurant is pretty fancy, but if it’s a special occasion and you’re in newcastle you should absolutely eat here. The gluten free options were incredible, they could make almost anything on the menu gluten free and the service was attentive and amazing. I had the smoked chicken with creamed corn and a side of greens and potatoes and it was genuinely one of the best meals I have ever eaten. The dessert selection was phenomenal too, I had a fennel panna cotta, and again, pretty sure it was the best dessert I have ever eaten. I cannot recommend this place enough! If you are around in Newcastle on a Sunday you have to head to the market, there was numerous gluten free options, but my favourite is below..
My favourite part of the Quayside Market was the stand for The Lilly Tree Bakery, a fully gluten free stand with a selection of cakes and pastries. I had the cappuccino cupcake and it was divine, I would definitely head here if I was in Newcastle again!